The following information is provided to assist students with University insurances. 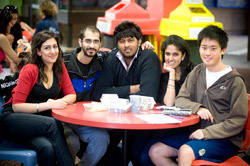 Ambulance Costs (Out of Pocket Expenses – Up to $13000 of cover subject to a $100 excess) under La Trobe’s Group Personal Accident Policy (93112602) for Students suffering an Accidental Bodily Injury and shall only apply whilst on Campus and/or engaged in University / Course / Sport / Club related activities and/or practical placement or community placement activities and/or voluntary work and/or unpaid work placement undertaken with the knowledge and consent of the University including Your necessary direct travel to and from such activities within Australia and overseas. To obtain any information in an alternate format please contact the Insurance Office. Email: insurance@latrobe.edu.au or phone 61 3 9479 1238.